One of the oldest video-game themes is the shoot-'em-up. Over the years, there have probably been more games of this type than any other, and while Gauntlet combines a few adventure elements to the long-standing shoot-'em-up theme, it's not enough to break it free from the shoot-'em-up category. Gauntlet offers one- or two-player play, with the two-player mode allowing both players to work together to achieve the highest score possible. And getting a high score is about the only goal in this game. What that means is that you have to wander around each level of the dungeon maze, gathering treasures and fighting off billions of bad guys. There's food scattered about to help you keep your energy up, and the lucky adventurer will also stumble upon potions that may be used to help destroy the attacking creatures. You fight the creatures in three ways: throwing weapons, using hand-to-hand combat or using magic. 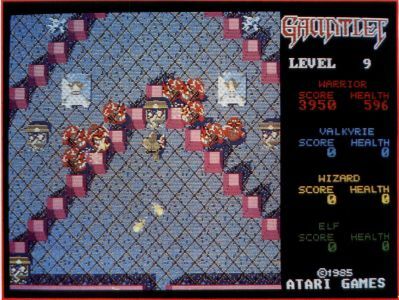 Gauntlet offers one- or two-player play, with the two-player mode allowing both players to work together to achieve the highest score possible. And getting a high score is about the only goal in this game. There are four different heroes you may choose among for your character, each of which has varying weaponry and magical abilities. The graphics are well-done, though, the sound is on the chintzy side. As for challenge, the first few levels are easy to complete; things don't really get tough until around the eighth level. Unfortunately, making things tough in a game like this means putting a lot of creatures and things on the screen. When that happens, the game attains a sluggish feel as the program tries to keep up with all the animation. Gauntlet holds very little appeal for me, though, I'll admit that there may be a lot of people out there that like this type of game. I think it gets boring fast. The animation keeps things interesting for a few games, but after a while even that begins to get humdrum. Recommendation: For shoot-’em-up fans only.